Like to attend our weekly gathering? 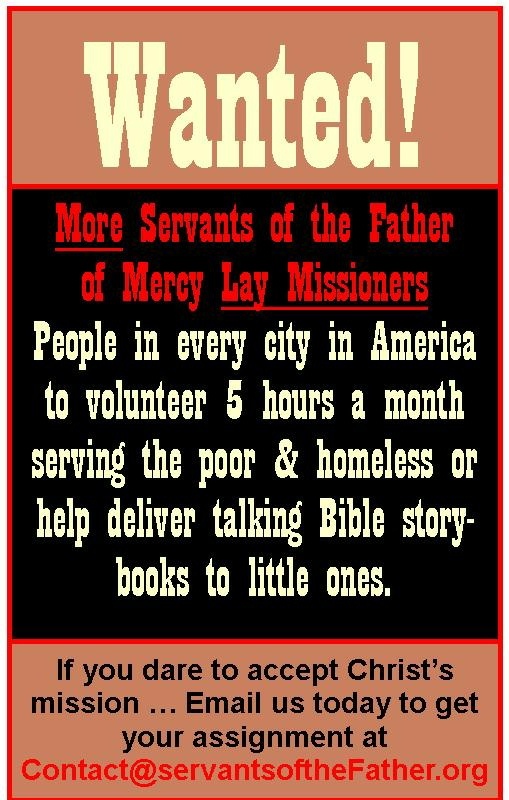 Interested in serving the poor homeless? Curious about being a lay or religious brother/ sister? For triumphal insights into everyone's poverty and brokenness, Subscribe! to our Homeless In America Blog. Log on www.HomelessInAmerica.BlogSpot.com and in the right column fill out your email address in the subscribe box. It's free! "Share your bread with the hungry, and bring the needy and the homeless into your house, with a joyful and eager heart. He who does acts of mercy should do so with cheerfulness. The grace of a good deed is doubled when it is done with promptness and speed. What is given with a bad grace or against one’s will is distasteful and far from praiseworthy." Saint Gregory of Nazianzen, 329 A.D.
Daniel & Julissa Making "Love Bugs" for Old Folks in area Nursing Homes!